It is a nice, cool Fall morning here in the Tucson area on the last day of September. 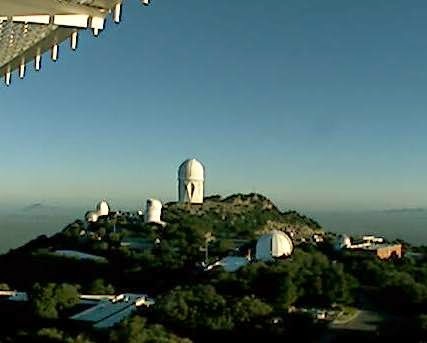 View from Kitt Peak above, looking north at about 7 am MST. Visible satellite image below from 6:45 am shows that skies over southern Arizona are almost completely clear, with only a bit of cloud cover off over the Chiricahuas. This was the first morning this Fall that I have worn a long-sleeve shirt when I walked - temperature here at house was 54 F when I returned about 6:30 am - very nice start to the day. The PW values are quite low over Arizona this morning, and I've shown both NESDIS institute analyses (CIMSS MIMIC above for 12 UTC and CIRA blended below for 13 UTC). Values are only half an inch or a bit higher over a small area of south-central Arizona (as per the CIRA analysis). 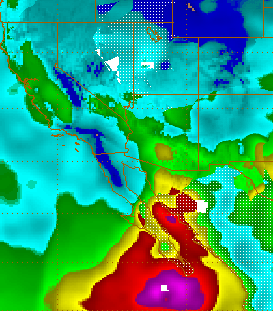 Both analyses show a high center of PW associated with the remnants of Rachel west of Baja. A large pool of mT air with PW of two inches or more remains over the east Pacific and GoC south of 30 degrees N - so the possibility continues for tropical storms to push this air northward. The global models indicate another storm developing this week and moving northwestward off of Baja - so will keep an eye on the NHC products this week. If this storm does develop, it will be "Simon." Looks like September will close out with two near misses and a big rain from an early morning MCS. View above is from 7:05 am MST this morning - Monday, September 29th. 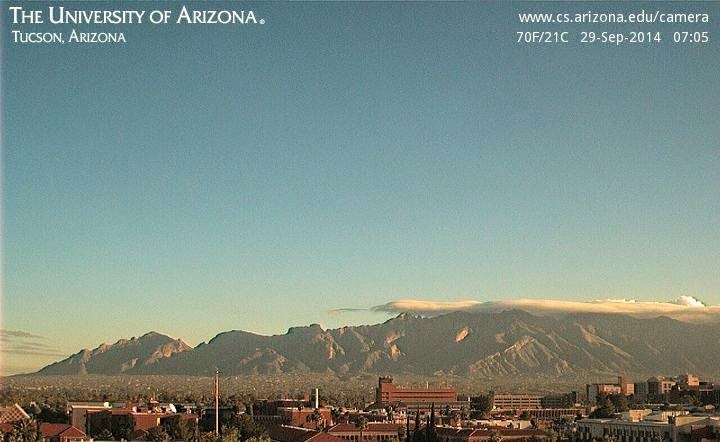 crisp clear skies except over the Catalinas where some clouds are still hanging on the mountain tops. Yesterday 6 ALERT stations in and near the Catalinas had light rainfall amounts. Looks like mostly northwesterly flow for the coming week - below is GFS ensemble mean 500 mb pattern valid on October 6th..
Jack Diebolt sent some interesting satellite images from early Saturday afternoon. Above is visible image of the north end of the GoC - radar echoes are superposed and show line of storms extending south almost to the ocean. Large, darker area to the right is the El Pinacate volcanic area. Image below shows the same area after the storms and clouds had moved a bit to the northeast. Of interest are the dark areas of sand now apparent to the west of El Pinacate. These are apparently due to wet sand having a slightly different albedo, after the rains that fell there. 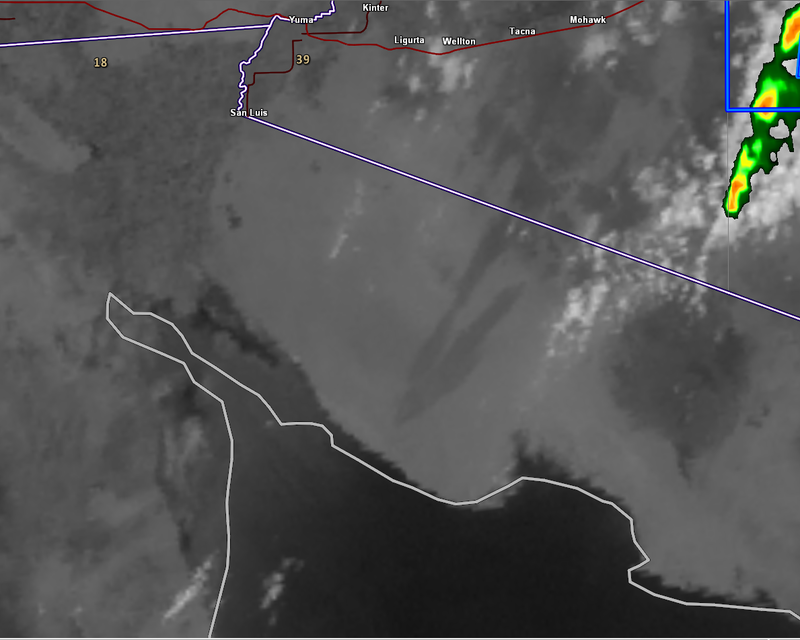 The wet sand areas were also apparent on some IR images, due to evaporation cooling the sands where the rain fell. The wet sand streaks apparently extend northward to the vicinity of I-8. Yesterday's heavy thunderstorms seriously avoided southeast Arizona. Lightning plot of CG flash locations above is for 24-hours ending at 5 am MST this morning (Sunday, September 28th). Some early morning storms were still active near Phoenix. The early morning WRF-NAM yesterday was actually a bit overdone for southeast Arizona, but had the trend for diminished activity this part of state correct. 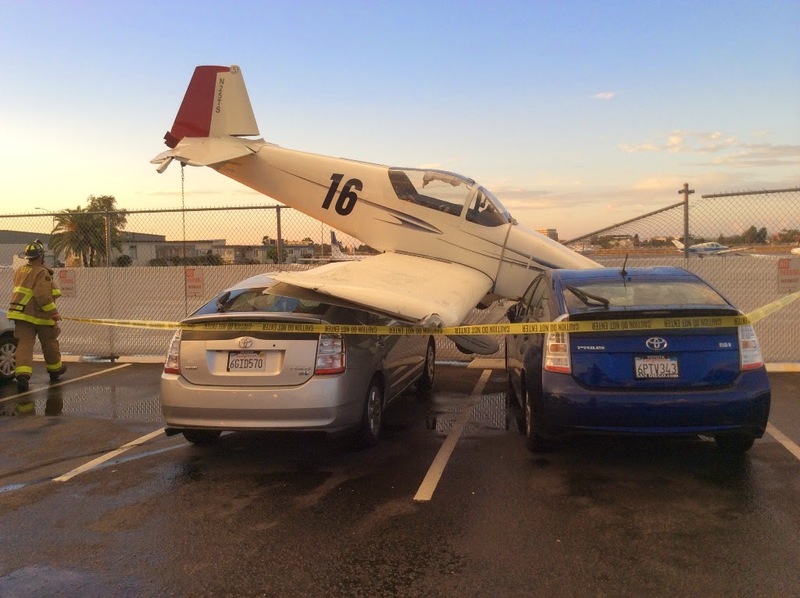 Phoenix area once again had heavy rains and widespread wind damage yesterday. 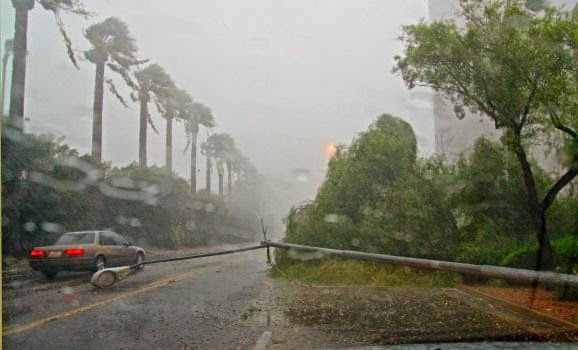 Photo below of some of the damage is by Alex Chihak, AP. Some rain amounts at NWS ASOS sites yesterday: Luke AFB 1.93"; PHX 1.66"; Flagstaff 1.19"; Prescott 1.36"; with the Grand Canyon and Winslow both having just a bit less than an inch. Why does it take so long for NOAA website and others to change the forecast when it is apparent even to a non-expert (from radar, etc.) that a storm is not heading towards Tucson? Today (Sept 27) it does not look like we are going to get anything, and Odile's remnants were obviously not going to hit us, either, yet into the evening we are still hearing big chances of rain. I know it's not a sure thing, but come on! There's not much I can say except that many forecasters, weather-casters, and even some forecast offices tend to stick with the models and react slowly to observed trends. It certainly has been a tough month for weather folks here in the Tucson area. Finally, Rachel (note, I misspelled name of this storm in earlier posts) has become a hurricane west-southwest of the southern end of Baja. This hurricane is forecast to become nearly stationary and then to drift southwestward. Yesterday thunderstorms totally avoided eastern Pima County and also much of Cochise County. Plot above shows 24 hours of detected CG lightning flashes though 5 am MST this morning (September 27th). Across the ALERT network for past 24-hours only 8 stations measured light amounts of rain. I don't know what I was distracted by when I showed the WRF-GFS model forecasts for yesterday afternoon - the forecast TUS sounding for afternoon was a classic one in which anvils from storms to the west cover the metro area and shut things down - which is what happened. Thunderstorms were widespread across south-central Arizona, western Arizona and the Rim Country. The bright colors in the plot indicate storms that were still active early this morning along the Rim Country and east of Phoenix. All of the severe thunderstorm reports logged at SPC for 24-hours ending at 12 UTC this morning were in the West (below). Two reports were logged in Arizona, near Green Valley and at the Nogales airport where a thunderstorm wind gust hit 59 mph. Situation this morning is quite complicated across southern third of Arizona. The sounding above is from Empalme (aka Guaymas) this morning and it exhibits high PW and very large CAPE, even though the wind regime is westerly. So, there's abundant unstable air south of the border. But the Tucson morning sounding (below) has almost no CAPE, due to dry air at low-levels, which has come in from the southwest. It appears that drier low-level air has come through Yuma and has also affected the rest of Pima County. So a key question for southern Arizona is whether there will be enough moisture convergence ahead of the approaching Pacific front to support storm development this afternoon. The early morning forecasts from WRF-NAM at Atmo seem to be reflecting the drying that has been occurring this morning, so I'll show a couple of graphics from that model. But note that the GFS version is much wetter this morning, and I may be zigging again with the wrong model. 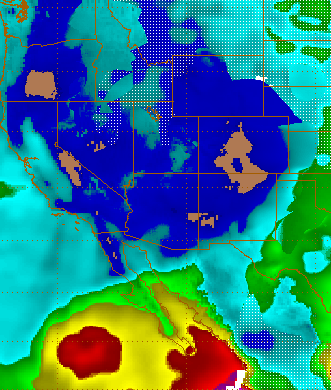 The WRF Nam forecast of PW above is valid at 3 pm MST this afternoon. The model forecast indicates a band of higher PW south-to-north from northern Sonora, through central Pima County and on to the Phoenix metro area. There is a second band of higher PW right ahead of the frontal zone. The WRF-NAM forecast of accumulated rainfall through midnight tonight (below) again has a large donut -hole centered on the Tucson metro area, with heaviest rains to the south of here and also all across northwest to central Arizona. The longer-term model forecasts indicate that the 500 mb low currently over California will be slow to move eastward because of the blocking pattern over the eastern 2/3rds of U.S. However, the dry air coming into western Arizona today gradually circulates around most of the system, drying out the Southwest. As for today, we'll just have to wait and watch. I have taken a quick look at the forecasts from the early run of the WRF-GFS at Atmo. I looked at GFS version because the model forecast the early morning storms to our north fairly well and NAM version did not. The forecast sounding for TUS (above) valid at 3 pm MST this afternoon indicates substantial CAPE, with very light steering winds - so model forecasts threat of heavy rains with slow moving cells. The WRF-GFS forecast of composite radar echoes valid at 5 pm this afternoon (below) indicates an active day with a number of areas of strong thunderstorms across the model domain. By 5 pm a number of strong outflows have affected much of the state, and an outflow from storms to west has forced the storms over the metro Tucson area. Forecast from the model of total rainfall through midnight (bottom) is quite impressive for most of Pima County. Edited to add at about 9:30 am - looks like the early morning showers have stayed off to the east of Tucson metro. This morning there is fairly extensive cloud cover across southeastern Arizona, and there are areas of showers and some thunderstorms north and northeast of Tucson. These showers are drifting slowly south and southwestward, so we need to keep an eye to the north this morning. Visible image above is from 7:15 am MST and composite radar echoes below are from 7:18 am. This is particularly the case give the quite unstable, 12 UTC sounding from TWC on campus this morning. The skew-T plot and diagnostics below are from the SPC. There seems to have been an outflow from the north before the sounding was taken. The air below 800 mb is cool but has substantial CAPE, with a bit of lifting. The same is true of the layer from 800 mb to just above 700 mb. So, it is quite possible that the showers and thunderstorms will propagate to the this side of the Catalinas. Many interesting weather features are in play for next three days. 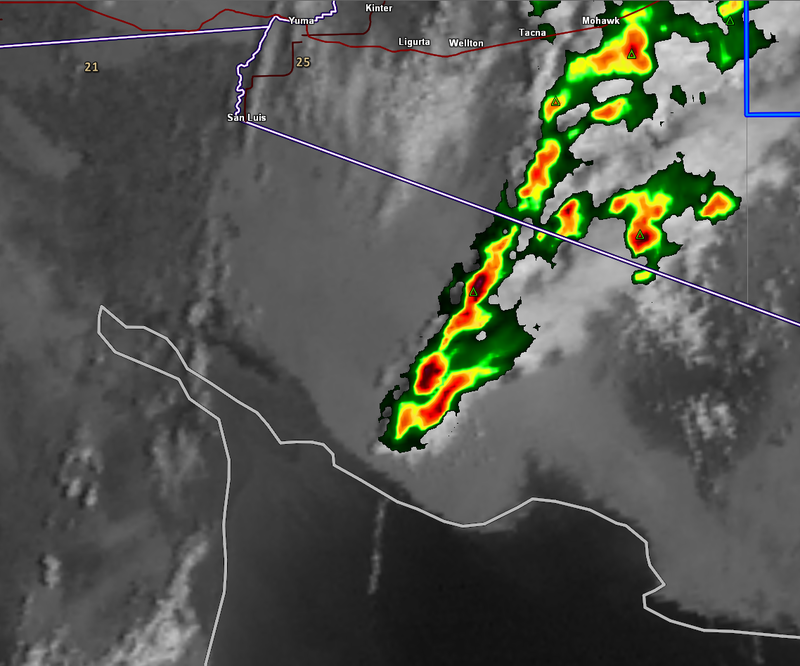 The large MCS that moved into the southern GoC yesterday sent a strong outflow of 30 to 40 mph winds north up the Gulf. The surface time-series for Yuma this morning shows a spectacular jump in surface dewpoint as the outflow moved into southwestern Arizona. The CIRA blended PW analysis for 6 am MST this morning (below) shows that PW has increased since yesterday over south-central Arizona and the lower Colorado River Basin. 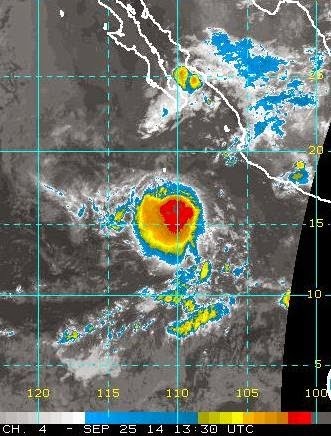 The NHC has declared that Tropical Storm Rachael has formed southwest of Cabo Corrientes (see 1330 UTC IR image above). 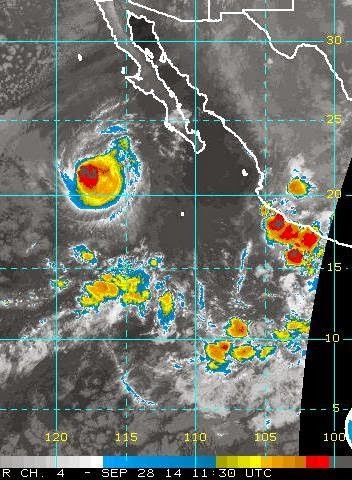 Their current forecast for Rachael is shown below, indicating yet another storm approaching southern Baja. The early WRF-NAM forecast for today indicates thunderstorms again hanging on the mountains of southeastern Arizona this afternoon. However, the model forecasts heavy thunderstorms for western Arizona tomorrow afternoon and across the state on Saturday. This will be a strong transition event - i.e., one in which a strong trough in the westerlies (see current NAM 500 mb forecast above valid at 5 pm on Saturday) interacts with subtropical moisture in lower levels. The early WRF-NAM forecast of PW valid at noon on Saturday is shown below. The intrusion of mT air from the GoC over Arizona will be clashing with the cold front and very dry air associated with the westerly trough. Because the wind shear profile aloft in these situations is similar to Plains settings in Spring, these transition events often produce severe thunderstorms and, at times, supercell thunderstorms - so there will be much to keep an eye on during the next three days. Edited to ad - From David Blanchard: This is the setup for supercell thunderstorms with large hail and tornadoes for [northern] Arizona. Here's a link to a Severe Local Storms conference paper I did on synoptic patterns associated with AZ tornadoes. These events typically have low CAPE but large shear. They often have deep layers of southerly winds with nearly straight hodographs that result in splitting storms. Image above is water vapor at 13 UTC this morning. A moderately large MCS was moving northward into the lower end of the GoC. The tropical disturbance to the south of this MCS may become TS Rachael, if it gathers strength. The PW has continued to decrease over southern Arizona, with morning values near or less than an inch (image below is blended PW analysis at 13 UTC from CIRA at Colorado State University). Note that values of around 2 inches and higher currently reside near and south of 25 N over the GoC. Although the early WRF forecasts this morning continue to cool middle-levels of the atmosphere, the decreasing PW is working in the opposite direction. The forecast of composite radar echoes valid at 5 pm MST tomorrow afternoon is shown above from the WRF-NAM - this is the most active hour of radar echoes forecast by the model for coming three afternoons. Pretty grim, with only isolated storms on mountains and over highlands of central Pima County. Same forecast but of PW below indicates continued dry conditions over southeast Arizona, but with increased PW out over the lower Colorado River Basin. That moisture may get picked up by the strong Pacific trough that approaches the Southwest on Friday and Saturday. Warm temperatures aloft in middle-levels continued to keep thunderstorm activity confined to higher elevations over southeastern Arizona again yesterday. Slowly diminishing moisture in the lower half of the troposphere also led to a marked down-turn in the amount of storm activity and this looks like the situation again for today. Mike Leuthold has added 500 mb forecasts to the product list for the WRF forecasts at Atmo, and I am happy to see this addition. I noticed that the early WRF-NAM run from last night begins to increase thunderstorm activity over southeastern Arizona tomorrow and especially on Thursday. The two 500 mb forecasts (above valid 5 am today and below valid at 11 pm MST on Thursday the 25th) indicate why the model forecasts are increasing deep convection. 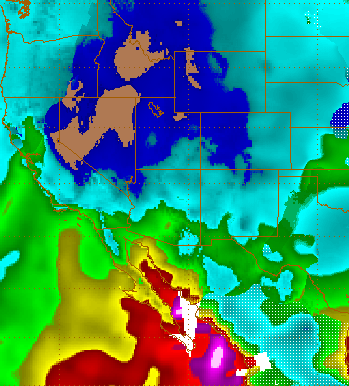 This morning 500 mb temperatures are around -5 C or a bit warmer over Arizona and western New Mexico. However, as the anticyclone currently to our southwest builds northeastward, the flow around the top and east side of the anticyclone begins to advect cooler air our way. The 500 mb forecast below brings temperatures of -7 to -10 C southward and westward over eastern Arizona and western New Mexico, resulting in increased CAPE, even though PW is down considerably from values of the past week or so. This forecast cooling in middle-levels would be a welcome change. A friend of mine, Mary Lakatos, was flying around last Tuesday and took these pictures, and I thought you might be interested in them. That day San Diego was in the outer circulation of Odile. It brought widespread east and southeast winds to the county. While southeast winds occur in the deserts regularly during gulf surges, they are very unusual on this side of the mountains. In our normal monsoon thunderstorms there is a convergence zone over the mountains where the southeast winds converge with the sea breeze. On this day that convergence zone was on the eastern side of the coastal plain and barely into the foothills. I watched clouds build up over my house, then the storms would move off to the west. It was dry enough so that there was an inverted-V sounding and strong downdrafts. Although they weren't all warned, I think every thunderstorm became severe. 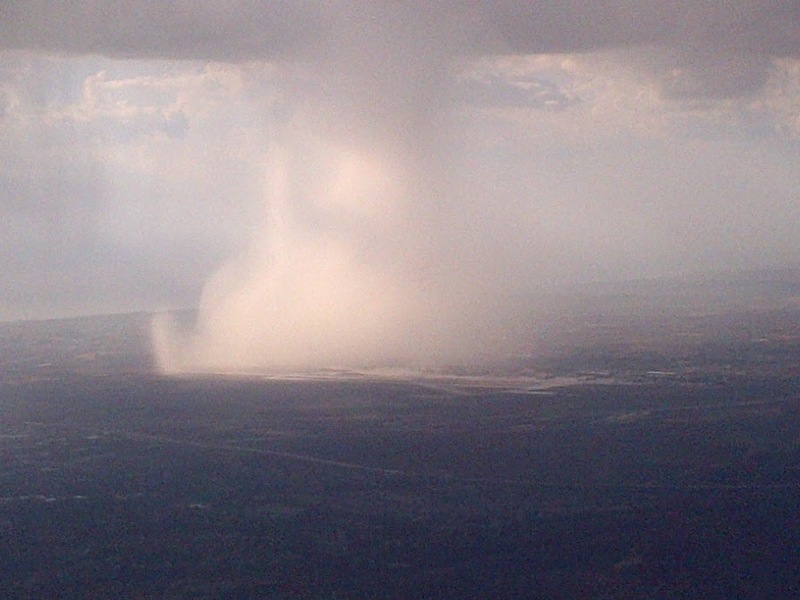 Anyway, she was flying around near Miramar Marine Corps Air Station and took these microburst pictures. That storm moved over Montgomery Field, a public airport with lots of private planes. The downburst caused extensive damage--10 planes were totaled and more than 20 damaged. The wind went from 8 knots to 56 knots in about one minute. They also got more than an inch of rain in less than an hour I think. Thunderstorms occurred a bit further west yesterday than forecast by early WRF-GFS model but not into lower elevations of metro area as WRF-NAM forecast. Plot of CG flashes above is for 24-hours ending at midnight last night, and indicates widespread thunderstorms over Cochise County. All of the activity in southeast Arizona tended to stay on the higher elevations. Eight ALERT stations had rainfall, with one site on Redington Pass going over an inch. continues moist below 600 mb with light winds below 400 mb. Very warm temperatures continue at 500 mb over Arizona and southern California. This will again keep storms over southeast Arizona mostly on the mountains again today. 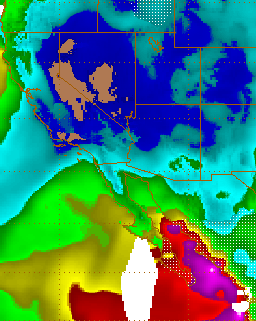 Both versions of the early WRF forecasts continue to move low-level moisture back into Arizona and southern California as the remnants of Polo move westward. The plot above is PW from WRF-NAM at midnight last night and plot below is forecast of PW field at midnight tonight. The NHC is indicating this morning that another tropical system is forming south of Mexico and the long-range forecast models again bring what would be TS Rachael near the south end of Baja toward the end of this week. Yesterday, there were showers and also some thunderstorms around southeast Arizona. Here in eastern Pima County the storms stuck mainly to the higher elevations. Across the ALERT network there was 30% coverage of stations with measured rainfall. However, this is a bit deceiving as the coverage at higher elevations was considerably higher and at low elevations across the metro area coverage was near zero. In the Catalinas there were 3 sites with more than half an inch and White Tail had just over an inch. As the official start of Fall tomorrow approaches, the two versions of the early WRF model run at Atmo have a split-personality type forecast for what might transpire today. This morning PW remains fairly high over southeast Arizona with values around an inch and a half (above is CIRA blended PW analysis for 12 UTC). Drier air circulating around the 500 mb low that is over central California has pushed across southwest Arizona, with the moisture gradient being strong across central Pima County. Note that TS Polo is passing west of the south tip of Baja and weakening rapidly - but high PW associated with Polo extends about 2/3rds of the way up the GoC. The TWC morning sounding (skewT from SPC) is shown below. 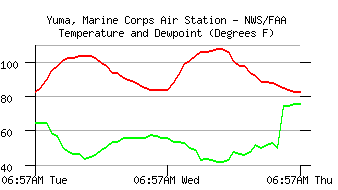 Dry air has intruded to some degree into the lowest levels (this is the case much more so up in Phoenix). However, there appears to be some CAPE still present in the 800 to 700 mb level - which would favor mountain storms again. Dry and warm air at and above 500 mb continues to be a problem. The wind profile is transitional and favors some organized, strong to perhaps severe thunderstorms over the eastern third of the state. As for this afternoon, the early WRF-NAM forecasts storms over eastern Pima County (forecast of composite radar echoes above is valid at 4 pm this afternoon). The GFS version however keeps storms to the east of Pima County - probably a toss-up at this time. As for tomorrow, the WRF version forecasts a resurgence of low-level moisture into south central Arizona due to the influences of Polo - WRF-NAM forecast of PW below is valid at 3 pm MST tomorrow afternoon. The GFS version is much drier, so again a toss-up. Forecasts for convection tomorrow are similar to today's in each version of the WRF. Both the ECMWF and the GFS forecast a strong, westerly trough into the Southwest and West by day 7, bringing in the Fall season for us by next weekend. There were some thunderstorms around late in the day yesterday (plot above is of CG flashes through 1 am this morning) - mostly along the Borderlands and also on the Rincons. The towers that broke through into the dry and sheared upper-troposphere were bent over toward the northeast and that will be the case again today. Across the ALERT network during past 24-hours 29 of 92 sites measured rainfall (bit over 30%). Amounts were generally light but there were localized downpours - see post below. Only 3 ALERT sites had over half an inch, with Keystone Peak west of Green Valley reporting 1.22 inches. This morning there are early showers again. Today the shower area is down to the south (composite radar below is for 7:30 am MST), and Nogales is reporting more heavy rain right now. This morning's sounding from TWC is shown above. Lower troposphere remains quite moist and CAPE is substantial again. Warm middle-level air continues, although there has been a bit of cooling come around the 500 mb anticyclone center that is over southern Utah this morning. This will be pushed eastward today by the closed low moving ashore over California. Warm air may return from Sonora, reducing CAPE by afternoon. Steering flow will be southeasterly, but shear above 500 mb will remain hostile - quite a strong upper-jet crosses western Arizona this morning. Dry air with the California low will battle the moist air over southern Arizona this weekend, with the main battle zone stretching south-to-north across central Pima County. By 11 pm on Sunday night the early WRF-GFS forecasts drier air (forecast below for PW at that time) moving into eastern Pima County. Both versions of the model continue to forecast isolated to scattered showers and some thunderstorms today and tomorrow across eastern Pima County. Down Day Yesterday - Now Norbert And ? ?